This coin is the third release in the Australian Sea Life series I and features a clownfish. These hardy fish are popular in saltwater aquariums. Bright orange with three black-bordered white stripes, this remarkable fish has natural protection from the stinging cells on the waving tentacles of the sea anemone in which it prefers to live. Contains 1/2oz. of .999 Silver in a flawless Proof finish. Reverse: Features a colourised clownfish and the Perth Mint's "P" mintmark. 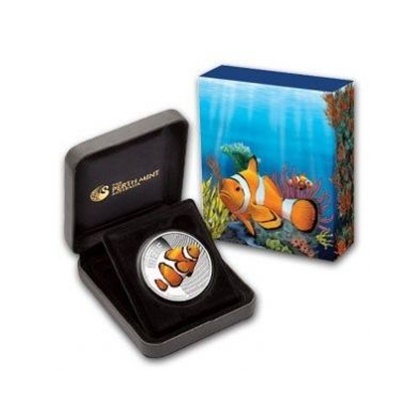 Each Silver coin is housed in a display case with a CoA and stunningly illustrated coral reef shipper.